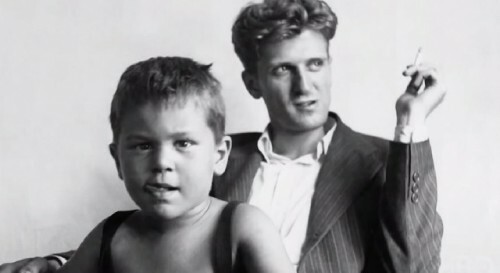 Robert De Niro Jr. sits on the lap of his father, the painter Robert De Niro Sr.
Footage of De Niro Sr. painting in the studio from the HBO Documentary "Remembering the Artist: Robert De Niro, Sr."
De Niro Sr. standing in front of a drawing. Footage from the HBO Documentary "Remembering the Artist: Robert De Niro, Sr."
Robert De Niro Sr.’s studio is preserved and maintained by his son. 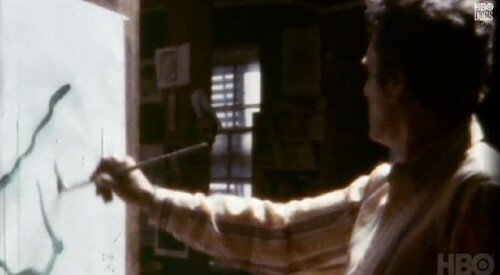 Footage from the HBO Documentary "Remembering the Artist: Robert De Niro, Sr."
Robert De Niro Sr. drawing from a Hans Hofmann class. 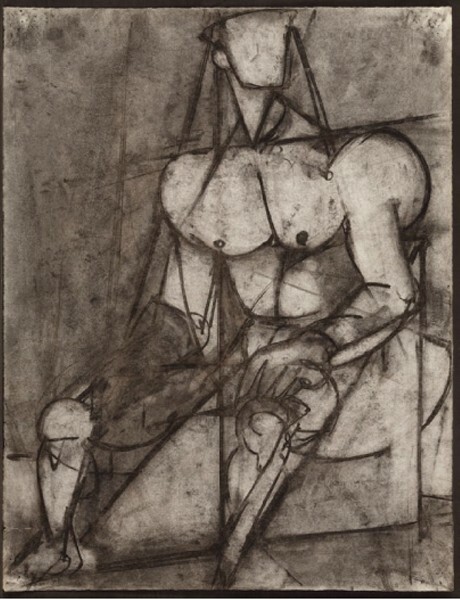 "Male Cubist Figure, Seated," Charcoal on paper, ca. 1941, 25 1/2 x 19 1/2 inches. Courtesy of the Estate of Robert De Niro Sr.
From the HBO Documentary film "Remembering the Artist: Robert De Niro, Sr."
On Father’s Day my dad and I watched “Remembering the Artist Robert De Niro Sr.” Viewing the film created by the renowned actor about his father allowed us to discuss my art-historical geekiness. The topic of American Figurative Expressionism, of which Robert De Niro Sr. was a key figure, has been my focus as an art historian. In 2013, I curated an exhibition on a group of Provincetown artists who emerged during Abstract Expressionism but conflated its emotional impact with representational imagery. The exhibition at the Provincetown Art Association and Museum focused on artists associated with that community, but Figurative Expressionism occurred simultaneously in Provincetown, New York City, Boston, Chicago, and the Bay Area of San Francisco. 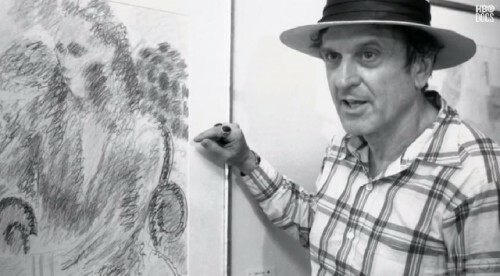 Robert De Niro Sr. was one of the seminal artists of the movement in Provincetown and New York City. While the documentary film gives us glimpses of De Niro’s painting, it was largely from the perspective of a son looking back at his father’s long and complicated life. 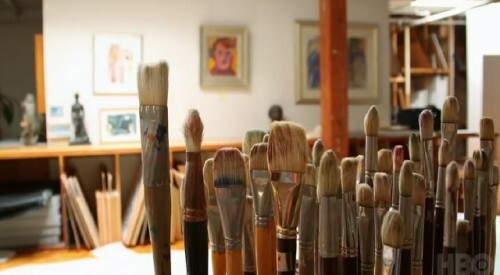 The film portrayed the artist's struggle to make a living through detailed in journal entries read by De Niro Jr., as well as testimony of his father’s contemporaries including the painters Al Kretsch, Paul Resika, the New York School critic Irving Sandler, Art Historian Robert Storr, and Megan Fox Kelly, an Art Historian and Art Adviser to the artist’s estate. The biographical details are interesting but the paintings themselves makes the strongest case for his legacy. The documentary was only 40 minutes, which felt a little too short to get the breadth of the diversity of a person that was being presented as both important and complex. The documentary is a great tribute but I would like to have seen a deeper examination of the artist’s oeuvre in the context of the figurative art movements of the mid-1950s. The documentary provides a compelling companion to the exhibition at DC Moore Gallery in Chelsea. Because of the involvement of a famous actor the appeal of this film extends beyond the art world. The directors Perri Peltz and Geeta Gandbhir, created an engaging film, which provides a profile of De Niro Sr. as a maverick who was well respected by his peers despite his working under the radar. The uniqueness of Robert De Niro Sr.’s work is among the unsung stories of Modernism. As with many of the Figurative Expressionists, De Niro Sr.’s legacy is overshadowed by Abstract Expressionism. His work was a part of the Figurative Expressionism providing a niche between expressionism and new image painting. While artists like De Niro Sr. kept painting in this mode for decades, in general, their efforts were neglected by the mainstream art world. The artist was a favorite student of Hans Hofmann’s who taught many renowned Abstract Expressionists in Provincetown and New York. He also studied at Black Mountain Collage with Josef Albers. In 1945 De Niro Sr. caught the discerning eye of Peggy Guggenheim who included him in a group show at her Art of This Century gallery in New York. Her gallery was an important showcase for established European modernists and emerging Abstract Expressionists. De Niro Sr. diverged from Abstract Expressionism by developing a style that integrated influences of advanced European art and emerging American figurative paradigms. He painted bold landscapes and portraits that reference Post Impressionist/Fauve high chroma color and abstracted forms. These elements were combined with gestural painting techniques and the spatial constructions of Abstract Expressionism. Unlike many of his contemporaries, who used fantasy and mythology in their work, De Niro Sr. was comfortable with interpretations and renderings of more traditional subjects. His loose, flowing brushstrokes shaped his signature treatment of thick outlines of reclining nudes, still lifes, rooftop scenes, and pastoral landscapes. 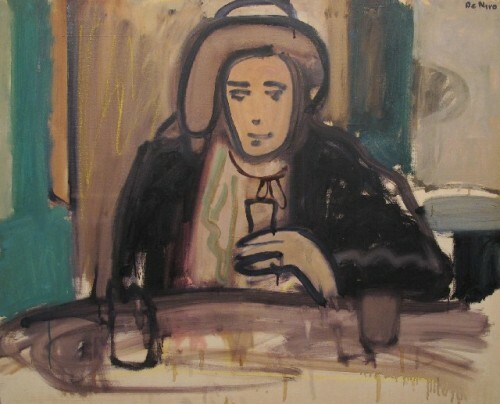 For De Niro Sr., subject matter was inspired by European traditions of the still life and portraiture. His still lifes were innovative by transforming familiar objects through a harmonious blend of luminous bands of sweeping color and bold line as vehicles for the artist’s psyche. His freely applied color bound together by heavy dark line suggests a mastery of Hofmann’s renowned push and pull method of spatial construction. Greta Garbo was a particularly important muse to De Niro Sr. although he never met her. De Niro Jr. tells a story of a missed connection De Niro Sr. had while riding the elevator with Garbo. His portrait of Garbo as Anna Christie (1965) was included in my exhibition Pioneers from Provincetown: The Roots of Figurative Expressionism. The artist also delved into subject matter such as the crucifixion, influenced by his interest in Renaissance painting. It would be interesting to see more of the footage used for the segments of De Niro Sr. painting in the studio. Hopefully it will be available for scholarly research through the artist’s Estate. Because the documentary premiered on HBO his work was introduced to a wide audience. This helps but an artist’s legacy depends upon scholarship and exposure through major museums and galleries. Now that the work has been exposed to a mass audience through a lively and accessible documentary further efforts are required to secure his legacy. Much remains to be done affirming his role in the movement of Figurative Expressionism, which is only beginning to receive adequate critical evaluation and museum exposure.